John Henry: Hey Brendan, how are you? Brendan Rodgers: I’m fine John, how are you? JH: Great. Brendan, I’ve been having Bill James look over some of the stuff at Liverpool in his spare time and I wanted to chat with you about it. JH: Yeah, he’s an American stats guy that helps us with the Red Sox. The Sox are in the playoffs again and he’s been bored, so I had him look at what’s going on in your neck of the woods. JH: Anyway, he likes stats and he did some stuff that I wanted to show you. Are you near a computer? If you check your email, I sent you the files so you can follow along. JH: Okay, this first one is what you guys looked like last season across the whole year. I know you didn’t have a true forward for the first half of the year and you lost Suarez for a while, but Bill said these numbers look really good. BR: On the form we had in the second half of the season, we probably would have made the Champions’ League. JH: Bill agrees with you. In fact, he said that the way you guys played football last season had all sorts of statistical significance in producing great results. 1st in the league in total shots, 3rd in possession, 4th in shots against, and 5th in passing success. Those are all great numbers. We probably made some mistakes in the summer before that season, but that’s on us. You guys did great work on the field. BR: Well thank you, John. JH: Now look at the next slide. This is Liverpool through the first five matches this year. I want to preface by saying that the results so far this season have been very good. JH: However, I’ve been talking to Bill, and he says the fundamentals are bad. BR: I don’t understand. We’re tied for 3rd in the table right now. JH: Yeah, but the league table doesn’t tell the whole story… We’re 10th in the league in shots per game, and creating an astonishing seven shots less a game than last year. We’re also fourteenth in the league in shots conceded. BR: Well, we’ve played some tough teams, John. We’ve also had some injuries. JH: I know you have, and I respect that United, Swansea, and Southampton were a struggle. That said… 80.4% passing completion? 49.5% possession?!? That’s simply not what we’re going for, is it? It’s certainly not what you guys delivered last season. These are the stats of a midtable team, and you posted better numbers with worse talent at Swansea. JH: I can hardly believe my eyes here, but the team right behind us in Shots, possession, and passing is Stoke. Stoke! We are not Stoke. We are Liverpool. Football. Club. 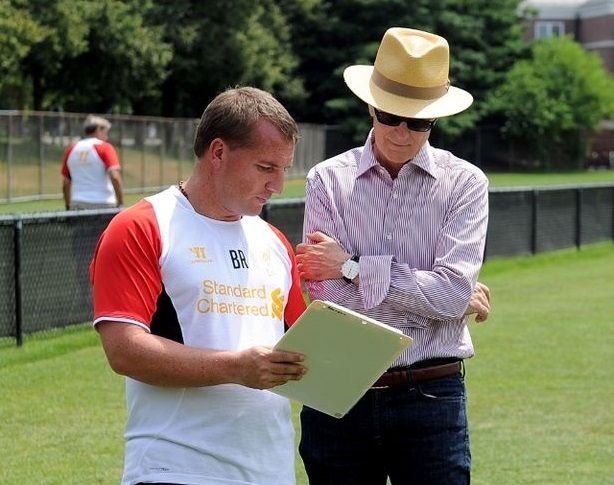 JH: I gotta ask, Brendan… where’s the tiki-taka? If you follow me on Twitter, you know I have expressed some concern recently about how Liverpool have been playing #secretfan. Their defensive shelling has proven pretty effective at keeping other teams from scoring once Liverpool gain a lead, but one of the side-effects of shelling is supposed to be better and more frequent chances from counter-attacks for the team that is ahead. That has definitely not been happening (and I watched this closely prior to Coutinho’s injury), which means Liverpool are ceding one of their strengths – creation of shots in possession – for nothing more than better defensive cohesion. Liverpool have solid results so far, but as you can see from the stats above, the football they are playing is a) quite a bit different from last season, and b) flipped to the point where Liverpool’s Shot Dominance is inverted (below 1), meaning they give up more shots than they take. If you do that for an extended period of time, results will suffer. There’s just too much math and probability working against your team to prevail. The thing is, Liverpool used to defend via sitting on possession, like Barcelona. And before Liverpool, Rodgers did the same thing with Swansea. So what happened? What changed? Where’s the tiki-taka? I can tell you that it’s not the absence of Chompy McBiteyface that’s causing this, because he was gone for large parts of last season and Liverpool didn’t play like this. Also, the stats were different before Ashley Willliams thugged Pip Coutinho (who I have named and shall refer to as “Pipinho” and you can’t stop me). While Pip’s injury is problematic on multiple levels, it’s not the underlying cause of the style change. Johnson played three matches before getting injured, so it’s probably not down to Glen’s absence either. Maybe someone should ask Rodgers? I mentioned during the Swansea match that Aspas just was not working out when deployed centrally. In fact, Liverpool had enormous problems transitioning from attack to defense for almost the entirety of the second half of that match. Swansea are good, but they aren’t Barcelona good. The loss of Coutinho hampered what was already an issue, and it was made abundantly clear that Aspas was not an effective solution (during that match and in general). Thus, I was disheartened to see the lineup Rodgers ran out for Southampton, likening the battle to last season’s Stoke vs. West Ham (helloooooo Under). Four centerbacks meant no overlapping runs to create on the offensive end. It’s somewhat understandable given the injury to Johnson and the fact that Lambert and Osvaldo are both powerful and not terribly quick. Even so, Liverpool’s issues recently weren’t defensive – stopping goals is the one thing they have excelled at. My real frustration, however, came when I saw the midfield and attackers. Sturridge is obvious. Given his talents and Coutinho’s current injury, Moses is as well. However, there are massive problems when you combine the other four. Give me just a moment and I will explain. What do you know about Southampton? They like to press. They are defensively sound. They also have serious issues creating on the offensive end, and their attackers outside of Adam Llalana don’t have a ton of pace, but they do get a boost from their fullbacks. 1) They are defensively sound. Breaking them down will be difficult. Even though Liverpool are at home, they may need to emphasize attack more to create goals. 3) They like to press. This one is really important. When you face teams that like to press, you have to take certain things into account. The first one is that they are usually pressuring the ball in the center of the pitch and in the offensive end, hoping to create turnovers there so they can get easy chances on goal. Liverpool should be familiar with the concept because they’ve done it themselves plenty, but not every team does this aggressively. In Liverpool’s case, it’s an even bigger deal because of a new addition this season: Simon Mignolet. You know your opponent has a goalkeeper who isn’t very good at distributing the ball. What do you do? Pressure the defenders and force back passes to the goalie! That’s exactly what Southampton did and very successfully, I might add. I also don’t think LFC were prepared for it, because they struggled with it. From Liverpool’s perspective, you have a GK who doesn’t pass that well and your defenders are getting pressured to pass back to him, how do you help your team out a bit? Add better passers, especially in midfield! This is a much bigger issue without Coutinho around as a release valve. Example: Dortmund pressed the living bejesus out of Real Madrid last year in the Champions’ League, with special focus on Xabi Alonso because they noticed that Real’s attack built from Xabi Alonso distribution. In response, Mourinho added Luca Modric into midfield. He realized that they needed an additional passing option to get the ball forward to Madrid’s incredible attackers, and added a second passing pivot to help bypass the press. Knowing that he had GK distribution problems and Coutinho was out, what did Rodgers do? Started the same guys as always! There are lots of issues with this. Lucas is great at what he does, but not an excellent passer. Gerrard is a good passer, but doesn’t have the legs that he used to have and can’t be relied on to dribble through pressure either. Henderson is quite industrious, but isn’t a +EV passer or a good dribbler. He completes few long balls a match and zero through balls. And Aspas is… well, through five matches, he’s not very good. He’s playing wide forward and only has two shots. He doesn’t dribble well, and his dispossession numbers aren’t great despite not seeing a ton of the ball. He is not making up for that on the defensive side of the ball either. It’s a little early to call him out as “bad,” but I will say he’s having a damned hard time getting comfortable. It’s possible that he’s as thrown off about the way Liverpool are playing this season as I am. Yet this is the fearsome foursome of players Rodgers went with against Southampton. In my mind, BR had to play Luis Alberto centrally. Another good passer on the pitch was an absolute necessity – one who could create a little time and could guide them through transitions despite Southampton’s press. Instead he came on a goal down in the 72nd minute and didn’t do much. Sterling and Moses could have been lined up as the two wide men (both can pass fairly well, even if Sterling’s first touch is about as subtle as a brick to the face), Sturridge up top, Alberto central, with either Lucas or Gerrard dropped. I also would have played Enrique at least, because despite how frustrating he can be, he can also pick out a longer ball and create overlaps (remember, LFC need help to break down Southampton). Anyway, this match was a mess. Rodgers whiffed tactically and personnel-wise, Pochettino came in with a good game plan, and Southampton stole points at Anfield. Now Suarez comes back, which means Liverpool either play him as a central, crazy distributor (I am on the fence as to how well he’ll work in the hole), or stick him wide right and terrorize defences with three of the fastest, most problematic attackers in the Premier League. The problem is… that doesn’t solve the transition issues that have existed all season. How does the ball get from defense to attack? Who bypasses any pressure? What the hell do they do if the opposition makes them keep passing the rock back to Mignolet? These are all questions Rodgers hasn’t answered this season, and teams will watch footage of that Southampton match and force Liverpool to deal with it. Through five matches, Liverpool’s stats look exactly like a midtable side. If they stay like that, Liverpool will likely be a midtable side at the end of the season, when last year suggested they are so much better. What happened to the high possession, high shots team Liverpool had last year, with or without Luis Suarez? Playing and producing like that team is damned important. I know the schedule hasn’t been a cakewalk thus far, but all I am saying is that there are signs that are a little troubling.